Discover the incredible underwater beauty of the dive sites near Padang Bai on this half-day scuba diving trip in Bali. Designed specifically for first time scuba divers with no prior experience, this trip will take you 40 feet deep in the Bali Sea for one open water dive. But before you go diving, you'll learn and practice essential scuba skills in a swimming pool. A certified dive instructor will teach you everything that you need to know to feel right at home among the corals and fishes of Padang Bai. After the trip, you can also extend your diving experience by enrolling in a professional PADI scuba diving course. • Get a taste of scuba diving on a scuba diving day trip in Padang Bai. • Learn basic skills and techniques of scuba diving on a short itinerary. 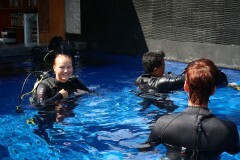 • Pave the way for future, professional PADI scuba diving courses. Discover scuba diving in Padang Bai, Bali! Report at the dive center in Padang Bai by early morning. You'll meet your dive instructor and begin with a detailed session about the basics of scuba diving. You'll enter the dive center's swimming pool, where you'll get comfortable with the equipment and learn a few skills in scuba diving. When you're ready, you'll take a boat ride to the dive site. Here, you'll complete one open water dive, under the supervision of your dive instructor. Return back to the dive center. Your trip ends here. Discover underwater adventures on a scuba diving day trip in Bali.